commented on "The Waterhouse Club tour Burra District's wonderful unique heritage. ..."
The Waterhouse Club tour Burra District's wonderful unique heritage. 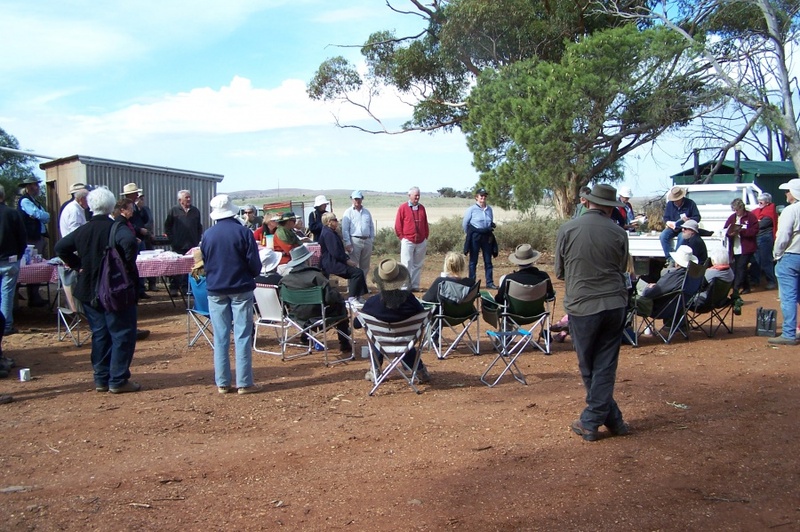 The Burra District was delighted to host the wonderful Waterhouse Club, led on this expedition by SA Museum's Mark Pharoah and Waterhouse members Tim and Gaye Fischer . The tour included many significant sites of our area, the famous mega flora at Redbanks, a tour of the wonderfully restored and highly popular Wilkins' Cottage followed by a delicious lunch. Despite a last minute panic as bread had been left out of the order, all enjoyed the BBQ lunch at the Mt Bryan east former school, prepared by the Sir Hubert Wilkins Memorial Committee Inc featuring Daphne Lines famous meat patties. During lunch, a talk on the lesser known philosophical beliefs of Sir Hubert Wilkins was given by Stephen Carthew and attention was drawn by Felicity Martin to the magnificent backdrop of Mt Bryan, home to Australia's most significant Blue gum, according to Dr Ian Brooker, and described as the 'wild Mt Bryan', where Sir Hubert spent many hours learning skills with local Ngadjerri people. Following lunch the tour set out on the Dare's Hill tourist route, of which the Dare's Hill view was acknowledged by all as one of South Australia's best kept secrets. Here Felicity Martin of Hallett pointed out Mt Pullen, or Ketchowla Hill as the destination for the inspection of petraglyphs which abound in the area from Pitcairn to Ulooloo, and the mystical Ketchowla springs, now sadly possible being impacted by cattle, as opposed to the former dominance of less heavy footed sheep. The delightful ruins of Piltmittialpa, which are some of South Australia's prettiest, were a talking point, as were the lonely graves that so often characterise the fate of early pioneering women. People wandered and wondered at the majestic Ketchowla main homestead and the tragic decay of such a testament to early pioneers. They also enjoyed the rare opportunity to have experienced the diverse ecosystems that result from dramatic topographic changes over such a short journey. Many questions were asked as to water, the superior craftsmanship of the homestead, with materials locally sourced and quarried. Then onto the Ketchowla Springs, adjacent to the North Well, which have two distinct styles. The later Ngadjerri ochre art, which had been protected after a long journey by Felicity through archeologist Heidi Crow, and the amazing petraglyphs, said to be over 44,000 years old, assuming the same period as those tested at Ulooloo. Sadly considerable damage to surfaces is occurring and indicated some assisted protective measures. Tired but content, a traditional cuppa and lamington before heading off to Terowie for dinner and a happy end to a diverse journey throughout the Burra District treasures.